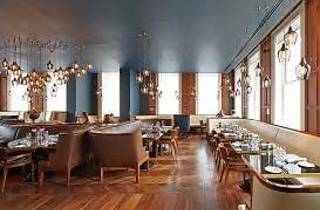 A high-end Modern British dining room installed in the Great Northern Hotel. If security checks and passport queues have left you mourning the glamour of travel, dine here. 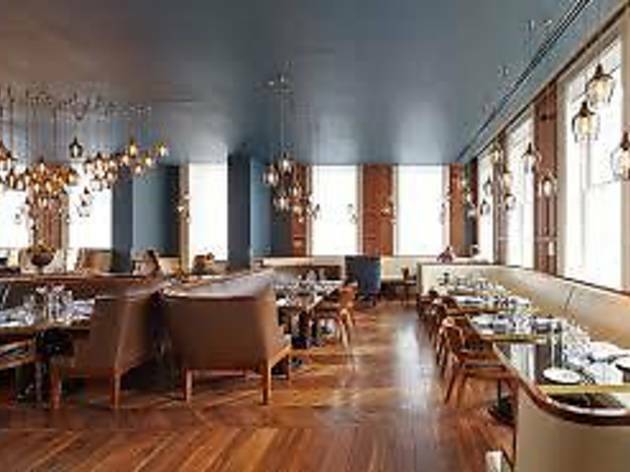 On the first floor of the Great Northern Hotel just beside King’s Cross Station, the check-in for Eurostar at St Pancras is but a fond adieu across the road, and the classy dining room seems to buzz with the excitement of having just arrived or preparing to set off. 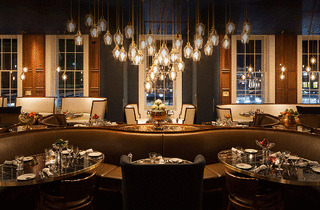 Directed by Michelin-starred chef Mark Sargeant, the kitchen showcases contemporary and classic British cooking. My dish of orange-poached figs in a salad with beets and English blue cheese was tangy, soft and well matched with crisp, candied walnuts. Mains aren’t cheap, but my companion’s lamb was pink, tender and, I’m assured, well worth the outlay, while my baked marrow melted deliciously on the tongue, and was served with heritage carrots that were earthy and delicately seasoned with coriander. Without a Continental train journey on which to snooze it all off, it was good to see that desserts are offered in two portion sizes. Thanks to the friendly guidance of the attentive but unassuming waiting staff, the piquant iced peanut and salted caramel mousse ‘little pudding’ proved just the ticket. Breakfast served 7-10am Mon-Fri; 8-11am Sat, Sun. Bunch served 11am-3pm Sat. Lunch served 11.30am-3.30pm Mon-Sat. Brunch served 11.30am-3pm Sun. Dinner served 5.30-11pm daily. I'd heard so much about this place that I was worried it wouldn't live up to the expectations but I couldn't be more wrong. This restaurant had the most beautiful interiors, loved the lighting, it created a really nice relaxed atmosphere. We wanted to try their signature plum and spilt milk dessert; caramelised plums on a spongey cinnamon cake with vanilla ice cream. This was heavenly! The waitress recommended a really yum dessert wine to go with it which was also amazing. We then tried another dessert; chilled coconut and cardamom rice pudding with mango and passionfruit which was also just as delicious! The desserts have definitely convinced me to come here for a proper meal one day. It is quite pricey, but the portion sizes are very reasonable. The pork rib was cooked to perfection, but the purée as a little dry, as if it was in the plate for a long time.. Still, it was delicious. The salad sauce was not at all remarkable, but as a side, I guess it makes sense. I also ordered the exquisite chocolate truffles – but that is definitely not for jut one person; I ended up taking a few truffles away! Plum and Spilt Milk isn’t the easiest place to find - you go into a hotel in King’s Cross Train Station, through the lobby and then up a grand flight of stairs with an interesting London / constellation themed artwork on the walls. Don't get mixed up with the restaurant on the ground floor of the hotel like we did! The dinning room is really beautifully done up and it has a good view of stunning St. Pancras Station. The menu is quite pricey. A full english costs £17 for example. Luckily, the Timeout Black Card gives you 50% off of food every day, with the exception of 5:00 - 8:30pm. We recently went for brunch and had an amazing feast - I ordered the veggie english breakfast, my boyfriend had the full english breakfast and we shared a portion of the banana pecan french toast. All of the food was delicious, we managed to not leave a single thing on our plates. The service was friendly but also very professional. At 10:00 on a Sunday, the restaurant patrons seemed to be a mix of hotel guests and people who had just walked in. The restaurant was only about half full at this time and we were able to take our time with the meal. I definitely want to come back to try the lunch or dinner menu with the Timeout Black deal. I enjoyed a TimeOut Black promotion of 50% off brunch here. We ordered almost everything on the menu. The food was nice and the service staff were attentive and informative. I don't know that I would go back here for brunch under the usual price list, but it's worth going once for a nice experience in the heart of Kings X. Despite the fact that the food is decent, I don't think I ever experienced such horrible customer care in my life. The waiter who served us did not pay any attention to us whatsoever, it took him ages to bring us our starters, he also seemed very grumpy and unfriendly when we were asking questions about the food, but this was not even the worst. We actually saw him (several times) putting his hand under his trousers and scratching and then be serving us and other customers the dishes, (!) without even washing his hands. At the end of our dinner, when the bill was brought, there was an OPTIONAL service charge of £11.53 on top of my overall amount, which I did not want to pay given the horrible customer care I experienced. However, I still put an extra £11, after which the waiter counted the money, looked at me with despise and asked for 53 p. Needless to say how humiliating it was, given that the amount of the actual bill was quite a large sum (that is without the service charge, which I do believe he did not deserve a single penny of)... We were genuinely shocked: lack of hygiene, poor service and rude behavior towards clients is definitely not something you normally expect from a seemingly higher class restaurant. I arrived in this gorgeous and busy restaurant on a Tuesday night for my anniversary as a special occasion. At first I was taken back, the waiting staff were no where near as friendly as any expensive restaurant I had been to before. I perused the menu, thinking I had made a mistake coming here this feeling lingered as we ordered our food. We had nice seats with, the place was really nice, but filled with what looked like city bankers not really the type of people I am used to dining around. The toilets also don't seem anywhere as nice as they should for such an up market restaurant. However our starter arrived and it changed everything. The food was absolutely fantastic, some of the best I have eaten. I would highly recommend both of the starters we had - the crispy duck salad and the haddock and prawn Thermidor - honestly some of the tastiest food I have ever eaten. While the mains were also delicious, I don't think they compared to the two starters we had, especially at their high price points - between £25-£40 per main. We dined with TimeOut Black membership which gave us 50% off the food, bringing it down to a normal price. Overall this place would easily have 5 stars if their staff were a tad friendlier, and they sorted the loos! But the food is just amazing, you have to try it at least once. We will be coming back to try their brunch asap. Me and the array of friends and family I have brought with me to P+SM have all been totally wow'd every time we have enjoyed a meal here. You are waited on tentatively by their extremely knowledgable staff to the point were you feel like you can trust them enough to pick your whole meal for you (almost). They make a mean champagne classic, have mastered cooking scallops and have somehow been able to make a baked alaska surprisingly dramatic. All this means I feel like I am beginning to become part of the furniture in this place (which is a good thing because its super comfy). When you're stuck in King's Cross, abandoned by various rail operators and can't stray too far, the Snug Bar in Plum + Spilt Milk offers a decadent place to escape the clamour. Ensconced in a corner, preferable as there's not loads of seating in the bar, sipping on a decent cocktail, it's very easy to lose track of time, and to get over whatever issues you have with your delayed train. The bar snacks/ small plates aren't bad either, particularly the Dorset crab & crushed avocado on sourdough. Overall very nice, slightly pricey, but a good atmosphere. The food is good. The seafood soup was excellent and so was the lamb chop. The service was a little slow , but thats ok as the place was busy. We had an excellent evening at P&SM, in all respects. The (first floor) room is very attractive and bright; the staff were exceptional throughout, and the food was really excellent - including vegetarian options, which had been given some thought and not just the usual 'standards'. Portions were generous, and we ate far more than we intended or expected, as it would have been criminal to leave anything. We had a look at the breakfast / brunch menus for future reference, and they look excellent too (not least a brunch for two which includes a bottle of champagne.....). North London has been crying out for a restaurant of this calibre, and we will certainly be going back for more. The Time Out Black Card Event on 23 August was one of the most enjoyable dining experiences my husband and I had. The cocktails (plus non alcoholic cocktails were willingly prepared and served) and mouthwatering canapes served in the bar downstairs were a great start to a wonderful evening. I liked all the six courses with wine pairing especially the starter, Crispy Goosnargh duck salad, spring veg & pea shoots. Also notable was the second starter of Orkney scallop. The main dish of Baked fillet of hake, Cornish clams & sea aster though not so colourful, presentation-wise, was also good. I particularly enjoyed the pre-dessert of Plum + Spilt Milk but found the second dessert, Iced peanut & salted caramel mousse a tad too sweet. Maybe it was diminishing returns setting in as I was very full by then. We found the decor and atmosphere of the restaurant very pleasant and relaxing and chatted the evening away with very friendly table companions. The staff were especially attentive and efficient. As we were impressed overall, we will be back soon for a Sunday roast. Our thanks to Time Out and Plum + Spilt Milk. I took my wife to Plum & Spilt Milk for the Time Out event last week and she realised that she'd actually been for a breakfast meeting before and had enjoyed it. The cocktails and canapés whilst we waited were all delicious. It got even better when we were served the 2 starter dishes! The crispy duck salad was probably my favourite dish of the evening, and the scallop follow-up dish was tasty too. The main of hake and clams was the low point of the meal though, and we both found it all to be very bland, but inoffensive. Definitely a strange dish to offer when trying to show off what they can do. Both the 'signature' plum and spilt milk dessert and iced peanut and salted caramel mousse were nice, but overly sweet, especially as we were very full by that point. The menu isn't cheap, and I wouldn't pay the menu prices myself for any of it except the duck salad. The staff were all very attentive and friendly, so no worries there. I'd recommend this restaurant for business meals or for those happy to splash some cash whilst waiting for a train. Time Out Cardholders may recognise me as "Ray - the guy who hosts the Film Screenings"
Well on Wednesday night, I did just that but then proceeded to Plum and Spilt Milk, where 70 readers were being hosted for dinner by the team at GNH. I said hello to each table , asking if they were enjoying their evening. I am not sure I have ever heard so many superlatives. Excellent, amazing, outstanding, delicious , incredible and on at least two tables " one of the best meals we have ever had "
I joined in for the dessert course , sampling two mouthwatering dishes with a fabulous sweet red wine. What a great evening. It was a pleasure to host , and an absolute treat to experience. I now know exactly where to dine when out in the Kings Cross area. As I left one of the staff said I should try their breakfast. She said it was the best in town. She said it with pride and belief. I am sold. See you for breakfast !!! What a wonderful surprise. I attended the Time Out Card dinner at Plum and Spilt Milk earlier this week. It was simply exceptional. From start to finish the staff were welcoming. After a brief drinks reception walking into the restaurant itself was a delight. What a beautiful room. Once packed with Time Out readers it really had a buzz ( which I guess is not the same every night ). The highlight of the night was the food. Six courses introduced by the chef and impeccably served by the wait staff. Accompanying wines were expertly chosen to perfectly compliment each dish. I am so pleased to have discovered The GNH. I did not know that such a great hotel existed right next to Kings Cross. I loved the bar - especially the outside area ( its was a warm sunny night ). I did not get to see the rooms but I imagine them to be very nice. As for the restaurant , I truly hope the team that welcomed and served us read this review, as I can only say thank you and add one word ....... Perfect ! Really enjoyed the Time Out event here (August 2016). The food was delicious and the staff were incredibly friendly and attentive. The restaurant is warm and welcoming - a world away from the busy Kings Cross below. I would highly recommend Plum and Spilt Milk for dinner or drinks and nibbles. The perfect place to bring someone you want to impress or to celebrate that special occasion. I'll be heading back to try the weekend brunch and hopefully sunday roast someday soon. Had one of the best dining experiences I think I have ever enjoyed here during a Time Out Card event. The venue is stunning, the food was perfect and the staff were all so knowledgeable about the products they were offering - a rare quality to find these days. Would recommend this place to anyone looking to go out for a special meal, whether that be a tasty brunch or the evening menu, or even for a cocktail or two! We came for a Timeout Card event - had a fantastic meal. The food was lovely (some of the wine wasn't to my taste, but I realise that this is probably a personal choice! ), love the decor of the place (feels like somewhere special to go) and the staff were great - really attentive (but as someone else put in their review earlier, not in your face). Had a fantastic evening here. The building itself is amazing as is the design of the restaurant. The food was top quality with good fresh produce, as you would expect. I would recommend the fish dishes. Also a great place for cocktails in the bar downstairs. The staff were very attentive and friendly but not in your face. Would highly recommend for a special dinner out. This is the place to come when you're feeling flush and want to spoil yourself (and others). A very sophisticated venue, with staff who are all eager to please. The canapes are light, mouthwatering and unusual enough for you to take notice (asparagus mousse, anyone? ), the signature cocktail which tasted of frozen blood oranges is to die for. The main meals are light, perfectly cooked - the baked hake was the best I've tasted - and actually interesting. It was rather strange to be served a pre-dessert before the dessert but I'm certainly not complaining. The wines were high quality (though the dessert wine maybe a little over-sweet). The evening was noisy and I found it difficult to hear my companions across the table - the venue doesn't soak up sound well, so I was pleased to be seated by the window, But for superb food and service, this place is hard to beat. Tasty extravaganza! Enjoyed a beautiful meal here on 23rd August, part of Time Out Card event. Food was beautiful and bursting with flavour. The staff went above their call of duty and were friendly and a joy to be served by. I enjoyed the vegetarian starter, off the set menu for the night, and was surprised to enjoy it AS MUCH as my meat eating friend enjoyed her duck. Superb experience. Came here last night for a Time Out Card event which was absolutely fantastic. We were served a ridiculous 6 courses, all of which were beautifully cooked, combining great flavors in a really unique and interesting way. The staff were super friendly, knowledgeable and very attentive, whilst the setting and restaurant interior was luxurious. Admittedly it felt a little strange being attached to a hustling train station, but other than that Plum & Spilt Milk could not be flawed. Perfect Breakfast meeting venue. My EA discovered it when it first opened and I loved it. Quiet enough to hear yourself speak, located in kings cross, great service and great quality food with a really nice decor. Ideal if you are in that area. I've been to Plum + Spilt Milk a few times now and have loved it every time. It's a little expensive but the quality is relative to this. My favourite dishes come from the starters and snacks for the table. The kidneys on toast are superb - meaty, juicy and almost sweet. This is also a great place for breakfast, and is exactly where I went for my breakfast this morning. 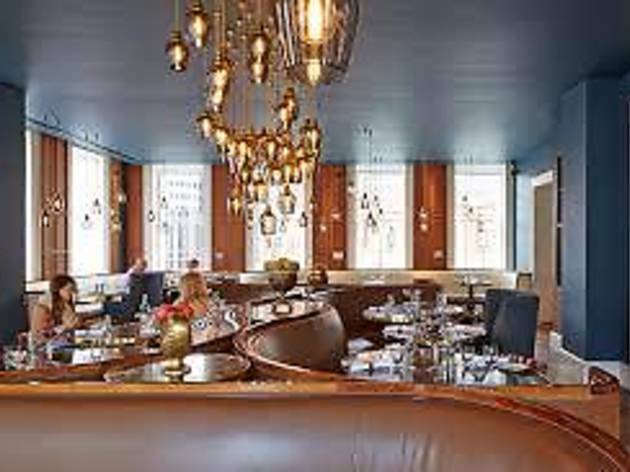 It's the perfect location for a breakfast meeting because it's elegant but not pretentious, and the food is refined. I adore breakfast, the ingredients are my kind of food. I love the mixture of healthy and comfort, and that's exactly what Plum + Spilt Milk's menu offers; the perfect mix. This morning, I went a little unhealthy and chose the Brioche Eggy Bread (more of a brunch vibe: even better!) which was topped with warm banana, walnuts and a sticky caramel sauce. It was a good sized portion, filling enough for breakfast. The bananas were sweet while the caramel had an undertone of bitterness which actually I quite enjoyed, through it wasn't the flavour i'd have expected. My colleague enjoyed the Haggis with Duck Egg which came presented similar to a steak tartare: very satisfying to the eye, and equally so to the tongue. I LOVE haggis and this was gorgeous, and brought together nicely by the gooey, runny egg. It was meaty but not stodgy. 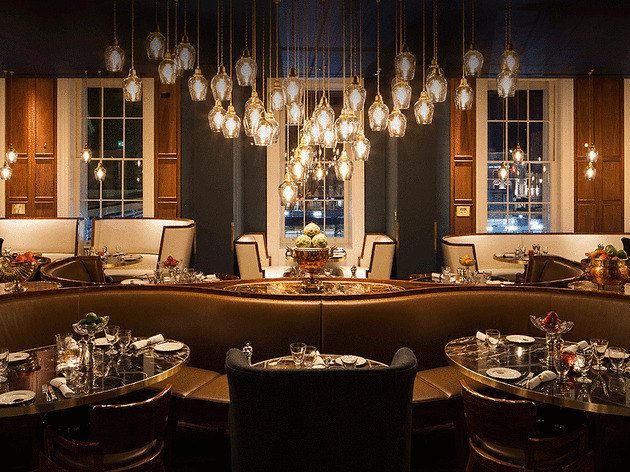 I adore the design of this restaurant; the chandelier hanging above the central tables is beautiful and eye catching. There is an elegance about this place that is just beautiful and makes it the perfect place for business or pleasure. 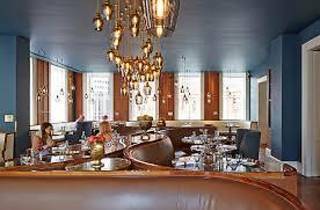 Such a beautiful and decadent restaurant with a great menu celebrating the best of British. I have eaten both lunch and breakfast here and both were delicious. The breakfast menu has all the classics with some extra exciting additions such as haggis with ducks egg and brioche eggy bread. Always worth booking as it is a very popular spot. The staff are very attentive and know their menu very well. Fantastic food, service and ambiance. I would highly recommend! I had wanted to go here for ages - so I had quite high expectations and they were mostly met. The decor is really fitting with the menu. I had the lemon sole for main, which I really recommend. And you have to try the plum dessert - perfect way to end the meal. exceptional service, good atmosphere. Steak cold on a cold plate. Too expensive for the standard of food on offer. Better spend more time there 'Sarge'. Went for Sunday brunch with family today. Delicious food. Great atmosphere. Good service. Lovely decor. Fair prices. Very impressed! Definitely five stars. Fancy PANTS. My first thought upon entering the super glam Plum and Spilt Milk’s grand bar – it was probably the chandeliers. Cooking up “Simple classics, beautifully cooked in the heart of King’s Cross St Pancras” is the tag line but I don’t feel this does it justice. Just to clarify if like me you turned your nose up at the thought of dining with some dude announcing the train departures over the tannoy, this little gem isn’t actually in St Pancras, but rather in the Great Northern Hotel. Upon entering you’ll instantly realise this is going to be a blow-out. Go with it ��� do it properly. Dinner for 2 will easily cost £100 but you won’t feel short changed. I’d recommend starting with a cocktail in the bustling bar downstairs before moving upstairs to dine under the hand blown glass light bulbs in the elegant dining room. Ladies try the Lady Violet champagne, elderflower vodka and raspberry liqueur, Gentlemen, I’d suggest the masculine 1854, Woodford Reserve, smoked pineapple syrup. The menu featured a number of sharing dishes for 2 people, such as the whole roast chicken with caramelised garlic or the special of the day, Beef Wellington, at *cough* £75 we passed. Instead I opted for the perfectly summery starter of Broad beans and Caerphilly on toast which was light and perfectly seasoned. Also delicious but much richer was the gooey Creamed smoked haddock and poached hen’s egg, perfect for dipping the homemade bread into. We tried 3 of the mains, the Salt Marsh lamb shank hot pot was nicely presented with potatoes topping melt in the mouth lamb, spiked with plenty of red wine. Also fantastic was the Monkfish curry which came with pilaf rice – beautifully spiced without overpowering the meaty fish. Slightly weaker was the Fish pie which came with a parmesan crust and a side of braised peas. I wanted just a little more fish but the mash was buttery heaven. The house carafe of wine represented great value and quality at just £12.50. The set lunch menu also looked like an affordable way to taste a little bit of luxury. Staff were absolutely flawless, being attentive, personable and not in the slightest pretentious. Highly recommended, do not hesitate to visit.